RAPAPORT... The Las Vegas jewelry week ended on Monday with trading reflecting a steady US market, despite the slower foot traffic at the various shows. Some noted that activity was better for jewelry suppliers than in the diamond pavilion at JCK as retail buyers sought out designs and collections for the fall and end-of-year holiday seasons. 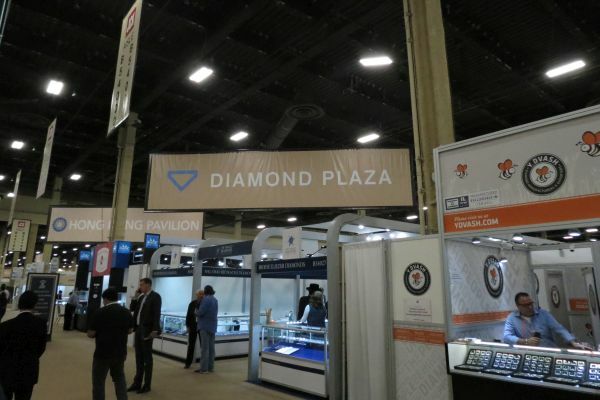 The average retailer comes to Las Vegas to look for some loose diamonds, said John Carter, president and CEO of retailer Jack Lewis Jewelers in Bloomington, Illinois. But the main purpose, he continued, is to establish relationships with existing suppliers and other retailers, understand the buzz in the industry and see new designs. “It’s a great way to find new suppliers,” he said. Similarly, in the loose-diamond section, suppliers questioned whether the shows were as vital as they used to be, with less traffic and fewer exhibitors attending this year. It’s not clear that the industry needs the shows, said a New York-based dealer, as dealers are engaged with clients throughout the year and buyers have access to goods online. Over 2,300 exhibitors participated in the JCK and Luxury shows, according to organizers, and more than 20,000 visitors were registered to attend. Many pointed to strong trading in the first quarter and said businesses didn’t need to buy inventory at the show. Sales are up in 2018, but profitability is a big concern for the trade. De Beers’ entry into lab-grown diamonds dominated discussions at the show, with the natural-diamond industry largely supporting the move to disrupt the synthetics market. Blockchain initiatives are gaining momentum, with some concerns about market segmentation. Polished prices are stable, with the RapNet Diamond index (RAPI) flat during the week of the show (May 29 to June 5). There is a shortage of goods in select categories, supporting prices. There is steady demand for round, 0.50- to 1.25-carat, G to I, SI diamonds. Fancy shapes are stable, with emeralds and ovals the strongest categories. Next year, the JCK show will be returning to its former venue at the Venetian and Sands Expo Center.